Sadly, gone are the days of drive-in movie theatres. 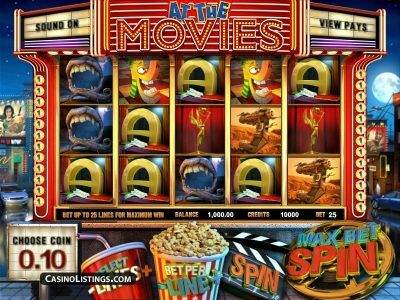 However, Betsoft takes us back to the retro movie days with this Bitcoin slot. Set in a classic outdoor movie theatre with the bright screen at center stage and your popcorn and soda at arms-reach. The bright red movie screen curtain paired with the fluorescent light headings make this slot appealing to the eye. With the light-hearted soundtrack and Oscar styled sound effects you feel as though you are right there anxiously awaiting the start of another great award-winning extravaganza. To all those movie geeks out there this game is available on all electronics. At the Movies is low volatility so while not Oscar winner worthy, it will award the punter with regular wins. This slot has 5 reels and 25 Paylines. 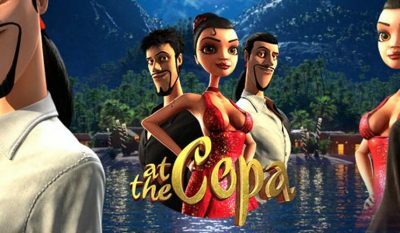 The characters include a caricature of Brad Pitt, a popcorn tub, a Star Wars fighter, an animated dog, oscar statue, a vampire mouth, 10 of hearts and a projector. The scatter symbol is represented by the easily recognizable film reel. The wild is represented by the classic comedy and tragedy masks. 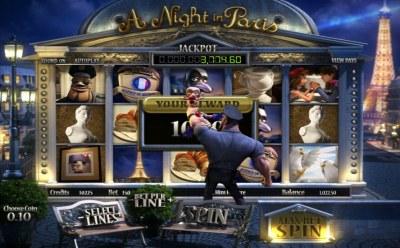 The controls consist of select lines, bet per line, spin, max bet, autoplay all set in typical movie related symbols such as Popcorn Tub, Soda Cup, and Directors Board. Above that are balance, credit, bet and an explanatory line on the right. Up above in left corner is the sound button, which can be muted and in the right top corner is view pays. This Slot has a scatter feature represented by the film reel icon symbol. 2 or more of the scatter symbols will trigger free spins. 5 scatter symbols unlock 20 free spins. All wins during free spins are doubled. The Wild symbol can replace any symbol except the scatter symbol. All wins that include the wild symbol lead to double earnings. There are not many bonus features; however, all line pays are multiplied by the line bet. 5 Oscars symbols results in a Jackpot. 625 000 Coins are the Maximum Win available. The symbols in the Bitcoin slot are well thought out and represent many great movies. The gameplay is one that you will see in many slots, so these symbols do well to make this game more original and easily distinguished from other games. The soundtrack can be muted if you are into the more artsy silent films. Make sure you grab front row seats to this Betsoft slot, its one not to be missed!